Wal-Mart shoppers will soon pay less for groceries. The retailer is slashing prices in its grocery department with a particular focus on fresh produce, consumables, and over-the-counter drugs, the company told Business Insider. Consumables include items such as laundry detergent and windshield-wiper fluid. The price cuts are part of a multi-year, multi-billion-dollar investment that Wal-Mart launched in the first quarter of the year. A buck for a jar of Pace salsa sounds like an amazing deal, especially when compared with the $5.98 Walmart charges for a 64-ounce bottle of the same brand. But again, a larger size results in greater savings. Walmart comes out ahead with a cost of about 9 cents an ounce, while Dollar Tree's 8-ounce jar costs about 16 cents an ounce, a whopping 44 percent more per ounce. Dollar Tree customers have to spend $8 to get the amount of salsa that Walmart sells for less than $6. While some office supplies, such as tape, are cheaper at Dollar Tree, others are cheaper at Walmart. Boxes of staples are one example. At Dollar Tree, a box of 3,000 sells for $1, but Walmart customers can get a box of 5,000 for 94 cents. That's more than 40 percent cheaper, although either box will keep most households in staples for a long, long time. Both stores carry the Miracle Whip brand, but Walmart has a sweeter deal. A 48-ounce jar sells for $5.80, or 12.1 cents an ounce. That's nearly 8 cents an ounce cheaper than Dollar Tree's small 5-ounce jars of the same product, which sell for $1. The savings at Walmart: about 40 percent. Dividing out the cost of Great Value brand black beans from Walmart -- $2.50 for four cans -- shows that they're a better value than the canned beans at Dollar Tree, which are a comparable size and sell for $1 each. 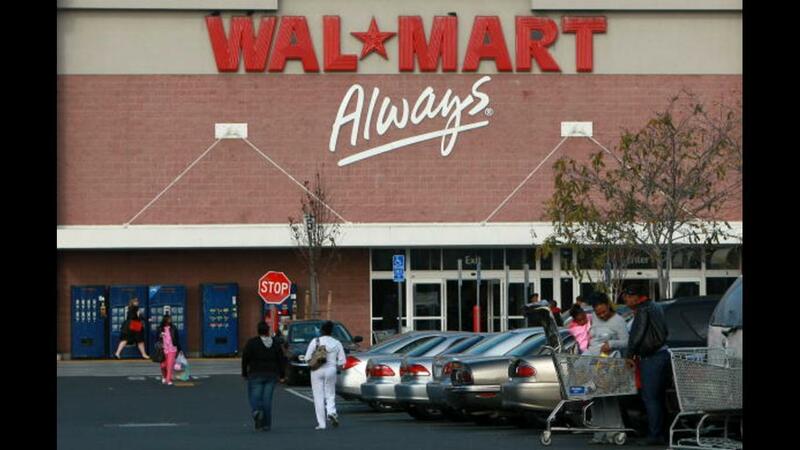 Walmart shoppers save almost 40 percent. Buy sandwich bags in larger packages at Walmart to pare down costs about 30 percent. Great Value Double Zipper sandwich bags are priced at $3.97 for 200 (2 cents each) at Walmart, while a $1 package of Good Sense Zipper Seal bags at Dollar Tree holds 35 bags (2.9 cents each). Preserving fruits and vegetables by canning is a smart way to save money and reduce waste. Save even more -- about 30 percent -- by purchasing the mason jars needed for the project at Walmart, where 12 wide-mouth, pint-size Ball jars, including lids, cost $8.47, or 71 cents each. At Dollar Tree, the same 16-ounce jars cost (you guessed it) $1 each. When it comes to juice, bigger is a better bargain. Walmart's Great Value line includes several flavors of juice and juice blends, sold in large 96-ounce bottles for only $2.50. Bargains also can be found at Dollar Tree, where 32-ounce bottles sell for just $1. But the per-ounce cost is 20 percent cheaper at Walmart -- 2.6 cents an ounce, compared with 3.1 cents an ounce at Dollar Tree. At Dollar Tree, customers can snag a five-pack of size 3 disposable baby diapers for a buck. That's a good deal if just a few are needed in a pinch, but Walmart's house brand, sold in bigger packages, is a better deal. A 36-count pack of Parent's Choice size 3 diapers is $5.97, or about 16 cents a diaper -- a 20 percent savings when compared with Dollar Tree brand diapers. The staple of college students and anyone else trying to save cash, Top Ramen is cheap nearly everywhere it's sold. Dollar Tree sells a five-pack of chicken flavor ramen noodles for $1, or 20 cents apiece, but Walmart has a better deal: A similar 12-pack sells for $2.10 -- just 17 cents a package, a 15 percent savings. A meager 79 cents may sound like a good deal for a 3.5-ounce serving of Cesar Classics dog food from Dollar Tree. But the same product, sold in bulk, costs less per can at Walmart. A 12-pack of 3.5-ounce cans sells for $8.46, or about 70 cents a can, an 11 percent savings. Dollar Tree offers 5-ounce bags of Canine Carry Outs for $1, or about 20 cents an ounce, but Walmart sells larger 25-ounce bags for a bit more than $4, or 16 cents an ounce, a savings of 20 percent. Snausages in a Blanket treats are similarly cheaper at Walmart, where a 25-ounce bag costs about 5 cents less per ounce than Dollar Tree's 4.5-ounce bag, priced at $1. Like a lot of items at Dollar Tree, Trident and other packs of chewing gum cost a bit more per piece because they're sold in lesser quantities. For example, a 20-pack of Trident sells for $1 at Dollar Tree, while Walmart offers a bag of three 18-count packs for $2.24. The price per piece comes to 5 cents at Dollar Tree versus 4 cents at Walmart, a 15 percent advantage. For bakers who prefer the convenience of a store-bought mix, both Dollar Tree and Walmart sell Betty Crocker brand chocolate chip cookie mix. At first glance, Dollar Tree's version seems a better deal. Priced at $1, it's less than half the cost of the $2.08 Walmart charges. But the price-per-ounce advantage goes to Walmart. Its 17.5-ounce pouch costs less than 12 cents an ounce, while Dollar Tree's price is 13 cents an ounce, an 8 percent savings. A ubiquitous staple of modern life, plastic hangers are essential for keeping an organized closet. While they are not expensive at either store, Walmart offers better value. A pack of 10 plastic hangers rings up at $1.17, while Dollar Tree sells an eight-pack for, of course, a dollar. The cost per hanger is 11.7 cents at Walmart versus 12.5 cents at Dollar Tree, a 7 percent savings. A lot of the toys carried at Dollar Tree are cheaper than comparable products at Walmart, but there are exceptions. For example, Dollar Tree carries Hot Wheels toy cars for a buck each, while Walmart sells them for only 94 cents, a 6 percent savings. Parties and other gatherings call for utensils such as ladles and spatulas for serving punch and cake. Dollar stores typically sell these for a buck, helping reduce costs and alleviating the angst of losing or breaking them. But here, too, Walmart may have an edge. The retailer often sells tongs and serving forks for 47 cents, spatulas for 77 cents, and ladles for 97 cents. The rollbacks will put pressure on Wal-Mart's profit margins, but the retailer is betting that resulting traffic gains will offset this, according to UBS analyst Michael Lasser. The price cuts could also help Wal-Mart fend off growing competition from German discount grocers Lidl and Aldi, Lasser wrote in a research note. "Should WMT fully succeed in creating a higher-quality, lower-price perishable offering, it could serve as a point of differentiation and help slow (but likely not stop) share loss to Aldi and Lidl in the coming years," Lasser wrote. In a price check last year, we found Aldi's prices were roughly 30% lower than Walmart's. Aldi and Lidl are both planning rapid expansions in the US. In addition to lowering prices on existing products, Wal-Mart is also working on expanding its private-label brands. This should result in even more lower-priced alternatives for consumers, since private-label products are typically cheaper than major brand-name items. To expand its private-label goods, the company has opened a new culinary and innovation center at its Bentonville, Arkansas headquarters that's devoted to developing and testing new items. At the new lab, the company asks test participants to provide feedback on new product shortfalls, such as whether an item is too sweet or not salty enough. "Taking this feedback into account, Wal-Mart is able to give each product a score. Once it meets a certain score threshold, it can release products into stores with a much higher likelihood of success," Lasser explains. This process will improve the success rate of Wal-Mart's new product rollouts, according to Lasser.